For some reason I have struggled with acne in my 20s. I don’t remember having an issue as a teenager and I have always used great beauty products. But once I hit my 20s, my face would break out, even if I were using what I thought were decent beauty products. It got really bad for a while and I tried everything. But I finally found a few beauty products that help to keep my skin not only clean, but also smooth and acne free. And of course you can find these amazing beauty products at Sephora! I love all of Philosophy’s beauty products. I have tried a lot of their different beauty products and I have been satisfied with all of them. But my favorite is their Purity Made Simple face wash. It is so gentle on my skin and it is one of those beauty products that get the job done without being harsh. It removes makeup great and leaves my skin feeling fresh and clean. It is meant to hydrate and tone along with cleaning away dirt, oil and makeup. You can use it around your eyes and it still deeply cleans the pores and helps condition my skin. You can get a small bottle to try that is 3 ounces or a larger bottle at 32 ounces with various sizes in between. I might only be 29, but I don’t think you are ever to young to start using anti-aging beauty products. 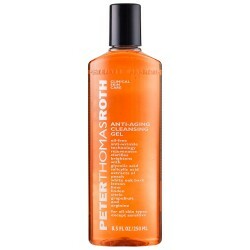 I recently discovered a beauty product from Peter Thomas Roth that I am obsessed with. Actually, I have discovered a few different beauty products from this brand that I love. The Anti-Aging Facial Cleansing Gel gets the dirt and makeup off while leaving my face feeling fresh and youthful. It has a sort of peachy scent that really makes my face feel clean. The beauty product is designed to help with wrinkles while brightening and clarifying the skin. It might seem a little pricey, but the bottle is good size and will last you awhile. 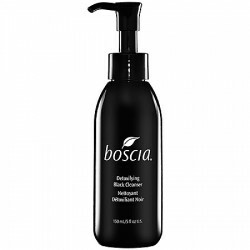 I have always struggled with blackheads and this cleanser by Boscia really helps. It is a gel cleanser that heats up when applied to damp skin and deeply detoxifies and cleans the skin. At first this beauty product scared me because the Detoxifying Black Cleanser is actually black, but I love how it warms up when I apply it to my skin. There are a lot of beauty products out there designed to eliminate blackheads and not only does this beauty product work, but it also removes oil and makeup leaving your skin feeling fresh.